Hot hens Marge and Lola are all a-flutter. Elvis Poultry is top bird and the chicken chicks are all shook up at the thought of seeing him perform. But how can they possibly beat out the top girl group, the Ducks, and win those tickets? The girl-chicks bird-brainstorm ideas for their act. Flying chickens? They crash land in the hay up to their wattles. Swimming chickens? Even their polka dot bikinis can't keep them afloat. It's almost time for the show, and so far the act is a no go. "We'll just have wing it," they conclude. The competition is stiff. The goats gobble a tractor; the cows jump over the moon; and the ducks grab their surfboards and catch a giant wave in the trough to wow the crowd. Then it's time for the hens to go onstage. "What's the matter? Are you chicken?" taunt the duck dames. This put the chickens in a foul mood. They bawked. They flapped. They shook. "More! More! MORE! the crowd chanted. "Let's bawk and roll!" said Marge and Lola. "You chicks rocked!" A rooster swooped to the stage. "You had me all shook up." ELVIS POULTRY WAS IN THE BUILDING! "I could use an act like yours," he crowed. But suddenly the contest ends with a a bang (or a CLUNK!) when the cows come home from their sojourn over the moon, scoring a perfect 10 in their landing on the Ducks, whose beaks are bent and whose feathers are definitely ruffled. And a new poster is soon seen on the barn wall. 50 BARNS IN 50 DAYS! 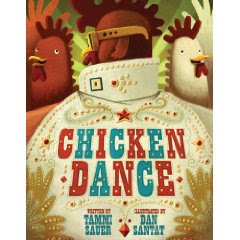 In Chicken Dance, Tammi Sauer and Dan Santat combine their talents in a funny and punny story which spoofs rock star mania. Santat's mixed-media ink and acrylic illustrations give body to this tongue-in-chick bit of drollery. Bawk on! Barnyard Babes! Tammi Sauer is the author of Cowboy Camp reviewed here, and Dan Santat is noted for his illustrations for Barbara Jean Hicks' The Secret Life of Walter Kitty, reviewed here.